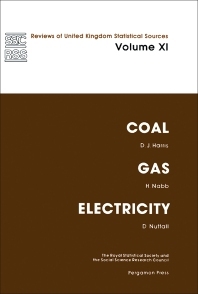 Coal, Gas and Electricity is a review of statistical data available for three fuel industries in the United Kingdom: coal, gas, and electricity. Topics covered include energy planning, comparability of fuels, published energy statistics, and energy consumption. This volume is comprised of five chapters and begins by explaining the purpose of energy statistics, such as to provide figures for the total production and consumption of energy and to identify the consumption of energy in sectors of the economy. A brief summary of industry activity concerned and its organization is given in order to present a clear background understanding of how data are collected; what is being measured; the stage at which measurements are made; what the reporting units are; the channels through which returns are routed; and where they are processed. The formulation of a national energy research and development strategy in the United Kingdom is then discussed, along with the comparability of fuels and government-published energy statistics. The last chapter presents statistics on energy consumption. This book will be of interest to energy officials, statisticians, economists, and social science researchers.